Amtrak business class is the most pleasant way to avoid traffic between San Diego and Santa Barbara. The journey on the Pacific Surfliner train takes about 5 hours. Driving usually takes about 4, depending on traffic. But, in Los Angeles, traffic can be brutal and appear when you least expect it. 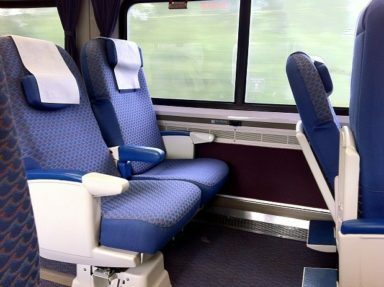 Is it Amtrak business class worth the upgrade? I definitely think so, in most cases. 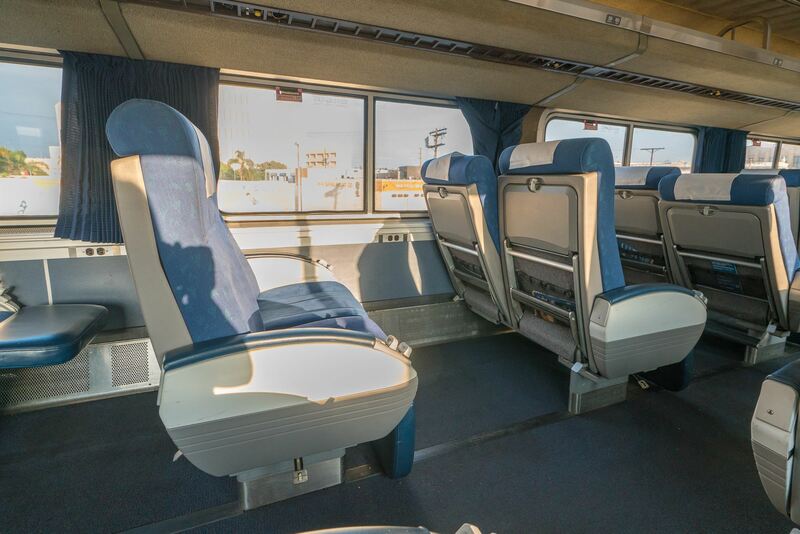 Note that business class seating varies by train and that this post specifically covers the Pacific Surfliner. Will I Travel By Amtrak Train Again? I didn’t know this until recently but coach passengers on Amtrak trains are not guaranteed a seat. This means that standing during a journey in coach is a possibility, especially if traveling during peak hours. 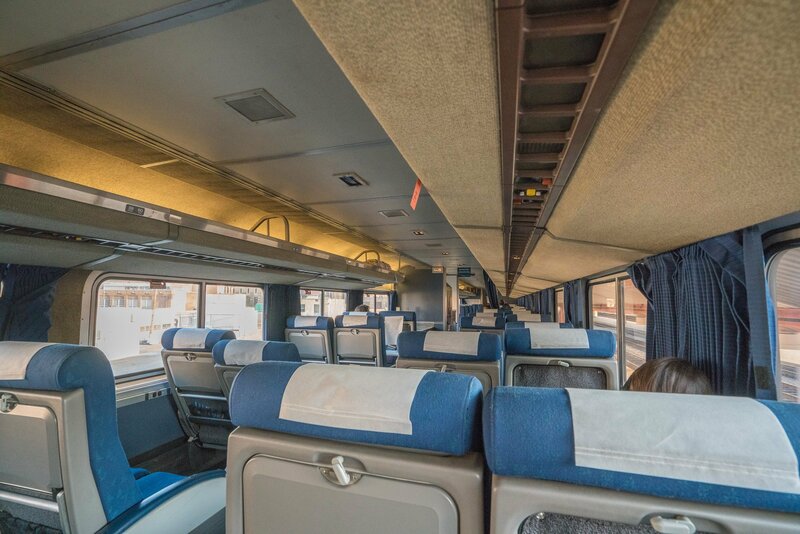 Amtrak sells exactly the number of business class seats as there are passengers in this class of service. 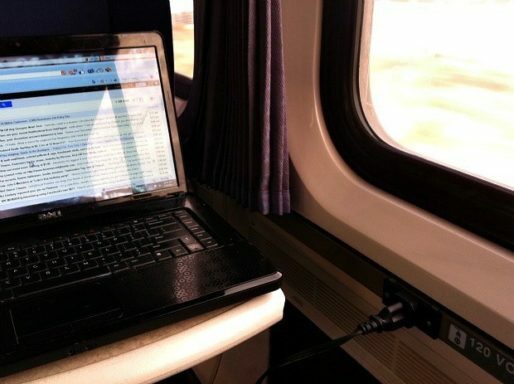 This is why you’ll see some trains sell out in business class but not in coach. Business class seats do have more legroom than coach seats but aren’t necessarily wider. The Pacific Surfliner business class seats do recline and there’s a flip down foot rest as well as a tray table. I’ve experienced two different seat types but they are more or less the same in style. On one of my trips, the conductor announced on the PA system that they were receiving “quality of life complaints” from passengers putting their feet on the seats in front of them, playing their devices on volumes way too high, and general disruption. I’ve never seen or heard of anything like this happening in business class. The business class train car is much quieter than coach unless you are sitting next to a chatty tour group from overseas as I was on my last trip. Part of the reason is because it receives less foot traffic from people passing through, as it’s at the end of the train. 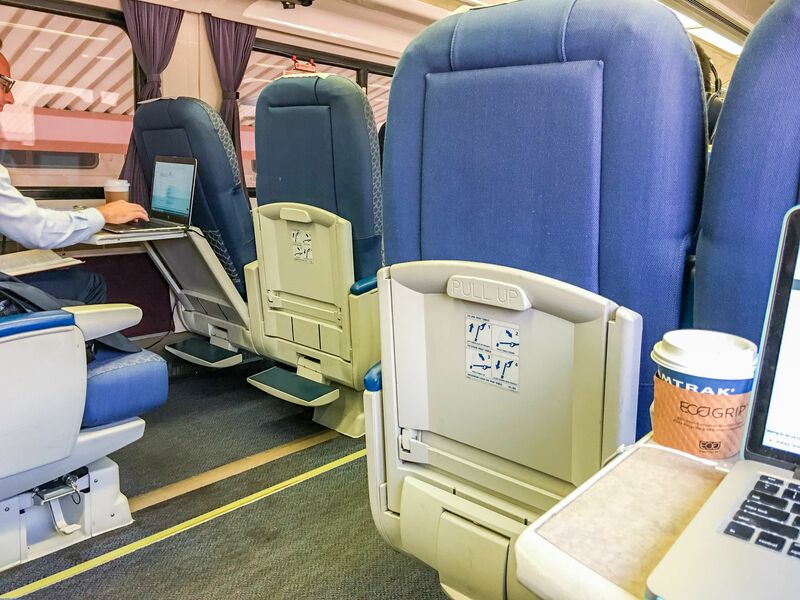 The Amtrak Pacific Surfliner trains, like other Amtrak trains, has free WiFi in business class and coach. This makes a huge difference to me, so that I can work along the way. Standard AC electrical outlets line the train’s exterior wall. This means that if you’re not sitting at a window seat, you’ll need to reach your plug over your neighbor in order to plug into the outlets. And, they are oddly spaced so that not every seat has them, even in business class. The WiFi is decent but does cut out on occasion, but it’s better than not having it at all. You will not be able to watch videos or download huge files while on it. At any time, you can walk over to the snack and drink area to grab a complimentary coffee or juice. In the morning, when I’m usually traveling by train, there are prepackaged muffins and pastries, too. But, this partially paid for the business class upgrade. I would likely have bought this myself and it’s the best Amtrak business class perk on offer if you ask me. I seem to get the wine and snacks at various times and haven’t been able to sort out a pattern. Regardless, I love it! 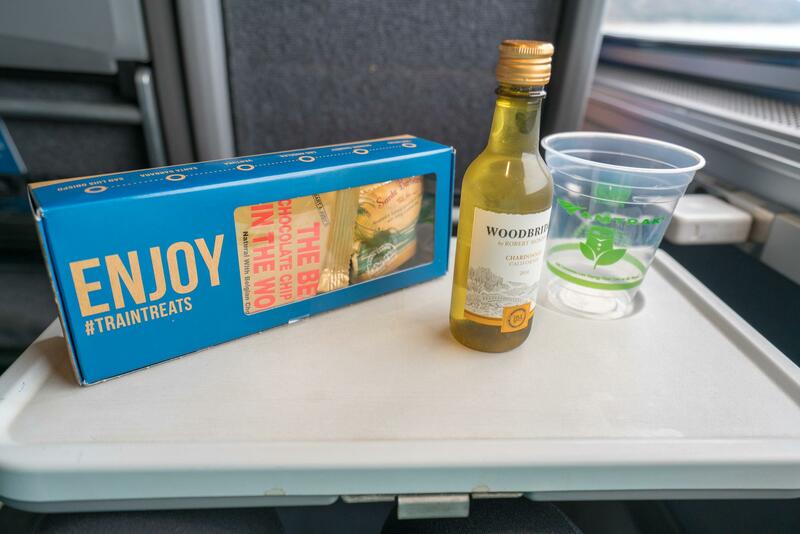 And, our train was delayed due to an accident on my most recent trip home from Santa Barbara so guests were treated to two rounds of snacks and wine, which I was very grateful for. On the flip side, I took an early train once which arrived in Santa Barbara before noon and no snacks or wine were passed out. The eco-friendly cup is made from plant materials which I appreciate. There is a cafe car usually next door to the business class car. 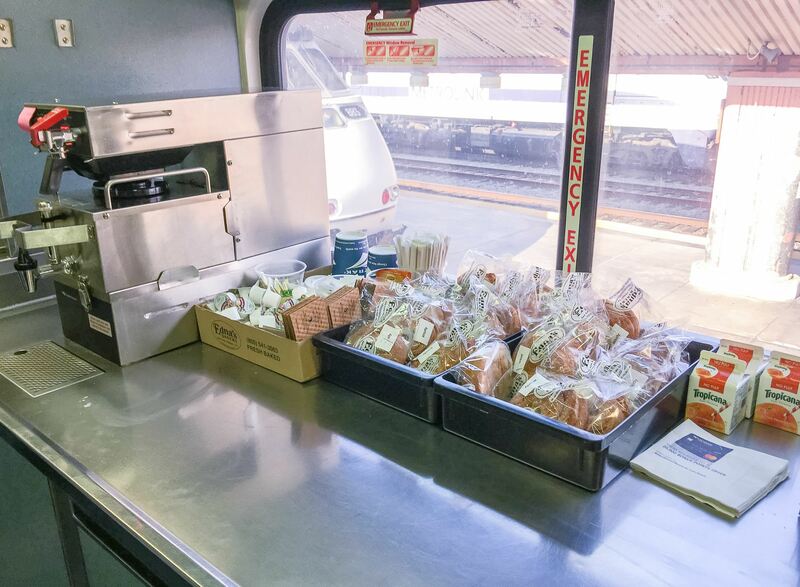 Here, Amtrak sells sandwiches and salads (average price is around $6.50). I had an artisan-style turkey sandwich on one journey and a cobb salad on the other. Both were just O.K. The salad was really fresh, but the sandwich had mayonnaise on it, which I dislike. I might bring my own lunch next time. 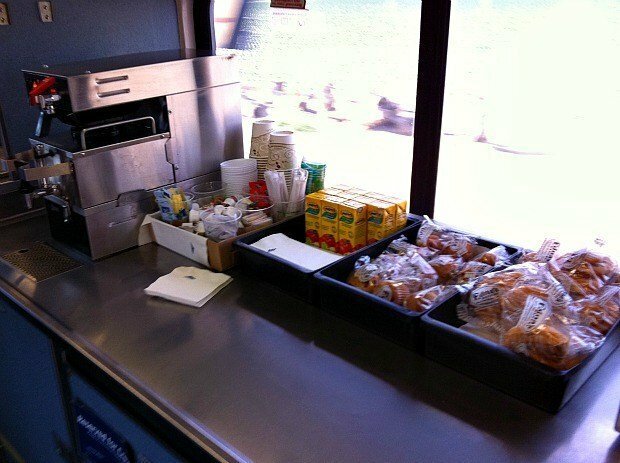 There are tables in the cafe car where passengers can sit and eat. 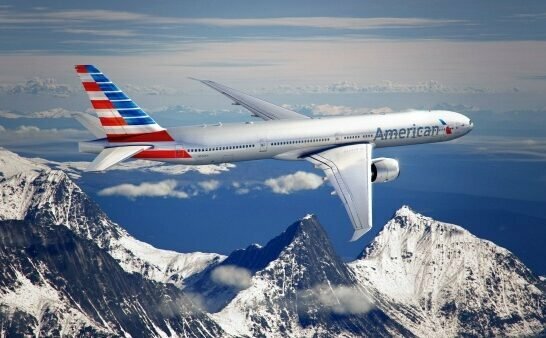 Members of Amtrak Guest Rewards will receive a 25% bonus points for riding in business class. Points can be redeemed for train travel and even exchanged to other loyalty programs via Points.com. The lower level is reserved for those who can’t get their bags up the stairs. It is definitely worth sitting upstairs in any class of service. Between San Diego and Santa Barbara (excluding some parts of Los Angeles), there is plenty of this. I always recommend sitting on the top floor of the train because the views are stunning along the California coast. On the Pacific Surfliner, you have the option of leaving luggage on the bottom floor luggage racks or carrying it upstairs. There is a rack for larger bags near the stairs. 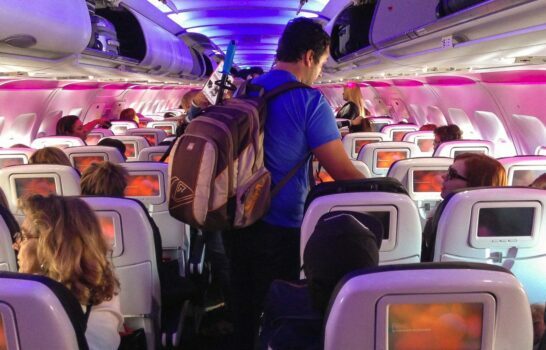 You can put smaller, carry-on sized bags on racks above your seat. Note that it is likely to be out of your sight on a luggage rack but so far this hasn’t been an issue for me. At the time of this writing, a Pacific Surfliner ticket from Solana Beach Station to Santa Barbara Station costs $40 plus an extra $20 for Amtrak business class, each way. That’s $120 for an adult round-trip business class ticket. A ticket for my 10-year-old would cost $80 round-trip. Children ages 2 – 12 receive a 50% discount on coach seats but they pay the same upgrade fare as adults do. Note that Amtrak also offers AAA and military discounts. 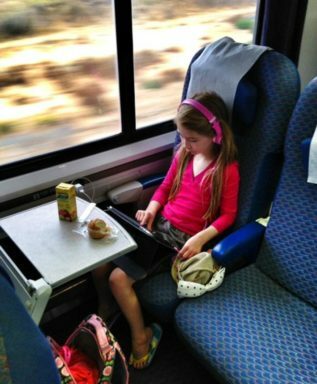 Cost might prohibit frequent business class travel on the train as, for our family, a trip to Santa Barbara is $320. However, considering that you’re not paying hotel parking fees (which in Santa Barbara can be quite pricey) or for gas, the additional cost for a long weekend trip becomes less. Plus, I also value my time. Over the years, I’ve become a huge fan of train travel in Southern California. It’s recently dawned on me that the Pacific Surfliner train stops at popular points of interest along the California coast, which really does enable people go carless. 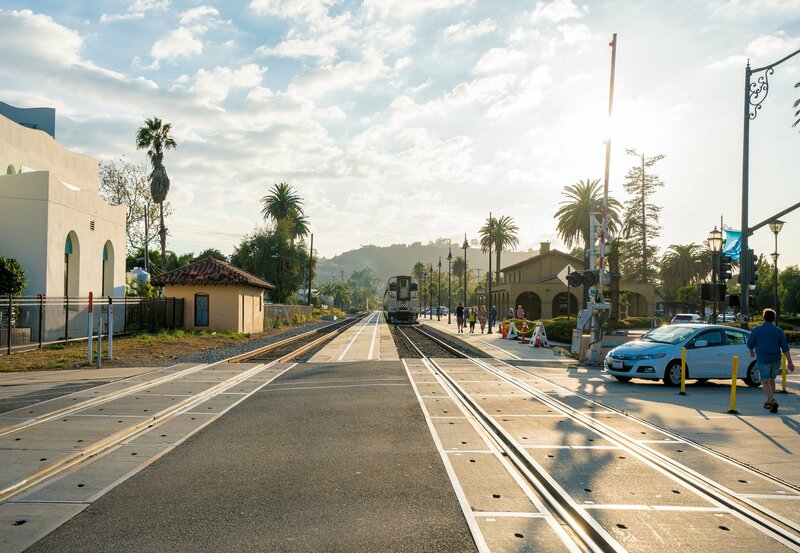 The train stops near Mission San Juan Capistrano (close to the beaches, too), Angel’s stadium, Disneyland, downtown Los Angeles, Burbank (near Universal Studios) and in the heart of Santa Barbara for starters. This means that you can sightsee without a car or more peacefully pop up to LA for the day. The Coast Starlight train is the talk of the town for its cool sleeping accommodations and Sightseer Lounge Car. San Diegans can take the Pacific Surfliner to Los Angeles and switch to board the Coast Starlight all the way up to Seattle. 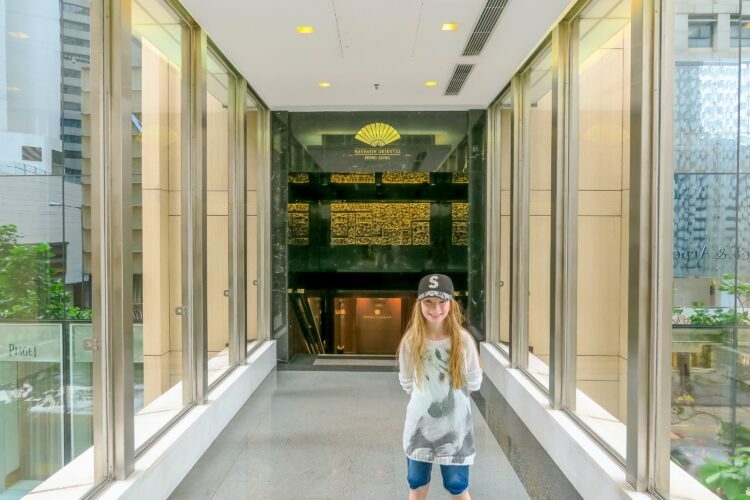 You could take advantage of the lounge at the Los Angeles train station with a long layover, only if traveling in business class. 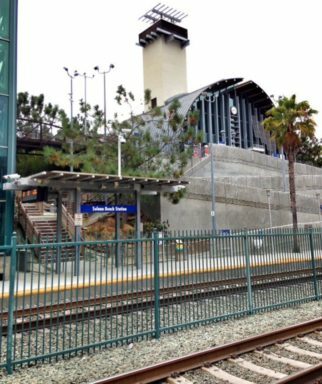 Solana Beach train station parking is FREE for up to 14 days. The trouble is that you may not be able to find a space. If you’ve parked overnight at Solana Beach Station, please leave a comment based on your experience. I usually take an Uber. Also, if the weather is cold outside, the station will be cold inside since it’s mostly windows. Do make sure that you’re on the right side of the tracks when your train comes, otherwise you’ll miss it. 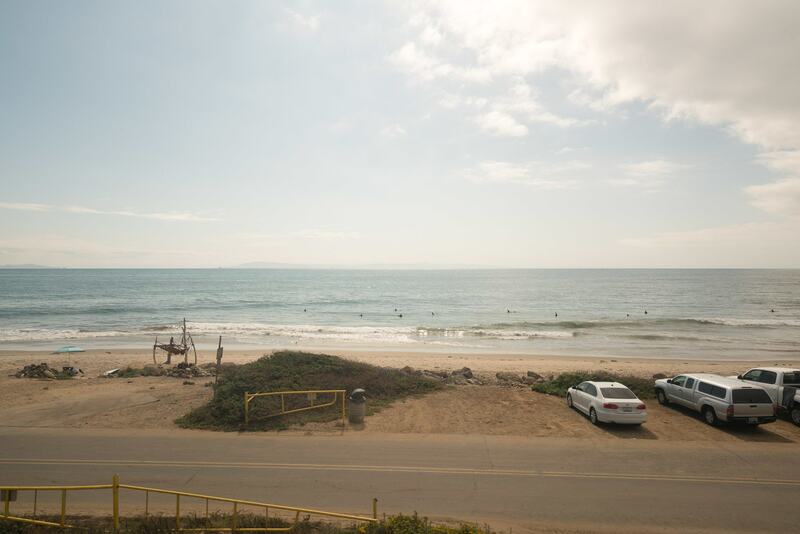 When heading north from San Diego, sit on the left side of the train to enjoy the ocean views which disappear around San Clemente and reappear in Ventura. The train, however, will change direction in Los Angeles so if you were forward-facing on the left side of the train (like you would be in the driver’s seat of a car), you’ll be rear-facing on the right side of the train. Change sides to enjoy the view. Of course I will. I actually always look forward to my Amtrak train journeys to Santa Barbara. 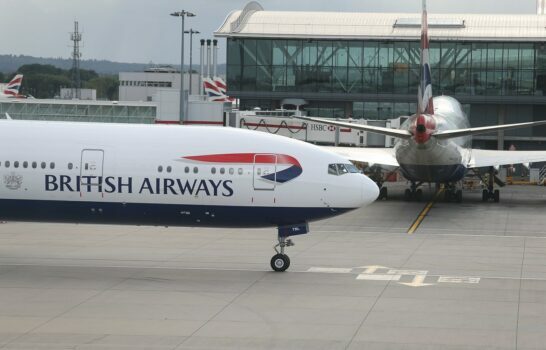 They are by far the easiest way to bypass traffic and I believe the upgrade to business class is worth the peace and quiet. The only time we don’t take the train is when we’re going to be heavily reliant on a car while there and can manage to drive during off-peak hours. 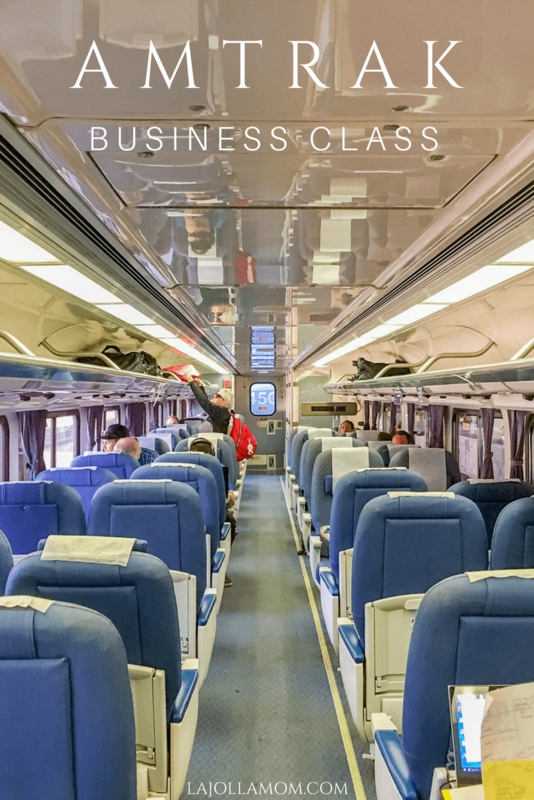 Do you travel in Amtrak business class? My son and I took the Amtrak from San Diego to Carlsbad one summer day to visit a friend. It was so relaxing to not be dealing with the traffic. My son was young enough to appreciate the experience too. I love reading your product and service reviews. Whenever i travel i also upgrade to Business Class just because it makes for such a far better experience and i enjoy my trip a lot more. Thanks for this! I upgraded to Business Class because of this review. One question: are the snacks unlimited? I read somewhere that you can only get one snack & drink for the whole trip. On both legs of my trip, they basically left the pastries, tea and coffee out for the entire journey and people went back to grab them as they pleased. They passed out a heartier snack pack (dried fruit, chips, some kind of cereal bar) along with soda or wine just once during my journey from Solana Beach to Goleta. Enjoy! Thanks for the review! I wish there were photos of coach to compare it to. Besides leg room, I think seating isn’t guaranteed which is why I would pay for Business. Also, are there taxi’s waiting at the station in case one is needed to get to a hotel? I know there’s trolley’s available but I was wondering if there were taxi’s. Thanks for this review! Can I ask is it possible to get on and off stops between L.A and San Diego? 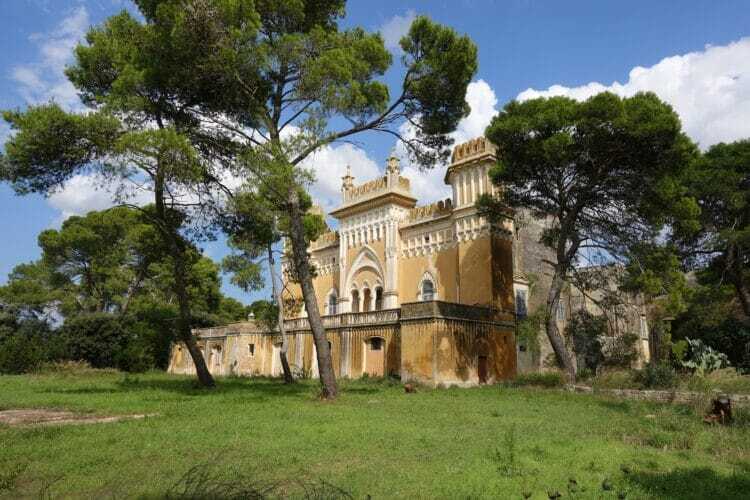 Would like to do some cycling along the coast? Yes! It stops several places and I do see people get on the train with bikes. I know it stops in Oceanside, San Juan Capistrano and I think San Clemente. This. was. exactly. what. I. needed. Business trip in Burbank through tomorrow, then a girls’ weekend in San Diego. Wasn’t sure which ticket to book but now I’m certainly going with business class … and will drag my carry-on bag upstairs for those views. I recently got an offer to work in La Jolla UTC, however, my gf wants to keep her job in downtown LA for about 6 more months before she finds work in the SD area. Can you recommend good apartment living close to the train station? I’ve looked at the Solana amtrak station but not the Oceanside one. We looked at Torrey Pines and Carlsbad areas. Either way she could drive a short distance to one of the stations, park, and ride to DT LA. Any advice on this would be GREATLY appreciated! We are used to LA/OC traffic but not sure how bad it gets in SD and in which directions. Gosh, I regret that I don’t have any apartments to recommend. Solana Beach has free parking at the Amtrak station but not really apartments nearby. UTC though is full of nice apartments actually and is a great, centrally-located place to live. A friend of mine lived in Renaissance apartments there and they are nice though I think maybe on the pricier side for the area. Sorry, I’m not very helpful! If she doesn’t mind the drive to Solana Beach, I’d probably recommend UTC or Del Mar/Carmel Valley area. Lots of apartments in Carmel Valley too, but the commute might be tough with traffic to/from UTC on the freeway depending on where you are. Is this train all the way ? I was looking at the schedule, and some places (cities/stops) it says “Bus” – like in Buellton – what’s up with that ? I’ve never taken it north of Goleta, but there are trains that definitely go north of Goleta. I think it sticks along the coast whereas Buellton is inland so I could see taking a bus to Buellton from Goleta. The run the buses after hours, too. I had to take one to Santa Barbara from LA because I was on a late train once. Thanks a lot for this, I’m touring the states for my (belated) summer vacation from Saudi Arabia this year and was undecided about spending 4 1/2 days in LA or splitting it up with a day in San Diego (helps that the Padres have a long homestand during the period I want to go). After reading your post above you’ve definitely made my mind up for me and I will be taking in the sights and sounds of SD (along with a cheeky business class journey on the Amtrak of course). On that note, as I won’t have a great amount of time is there anything you would recommend that I see/do whilst I’m in SD? Hello ! I did read your article and i like it very much. I am taking my first Amtrak Business Coach ride from Washington D.C. to New Haven Ct this Sunday. I can hardly to go . It has been several years since i have been up North. Thanks for this review – it is very helpful. Have never taken the train from Santa Barbara to San Diego, but will be doing so in about a week for, unfortunately, a friend’s wake. I was uncertain about the extra percs for Business Class but will definitely be booking that now. I take the train once a month to visit my HQ in Simi Valley. I park at Solana Beach, which, like you said, is free. I have never had a problem finding a spot, and many times, I have to park near the far end of the parking lot. It seems to be pretty safe, too. I’m confused, after checking the Amtrak website pages…For northbound travel from Solana Beach to Santa Barbara, must one change trains at Union Station in Lis Angeles? (Or, does the train, boarded in Solana Beach travel all the way to Santa Barbara? 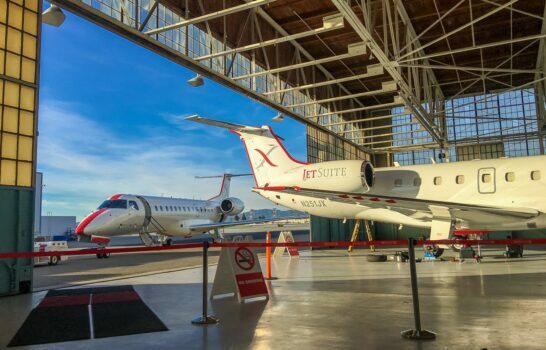 It does travel all the way to Santa Barbara but there are some options to switch in LA. If you want to try the Pacific Starliner, that’s what you would do. I’m also not sure if you’re not seeing it because we had some rail work done in SD (there were no trains for a few days I read). Amtrack business class was not as expected. 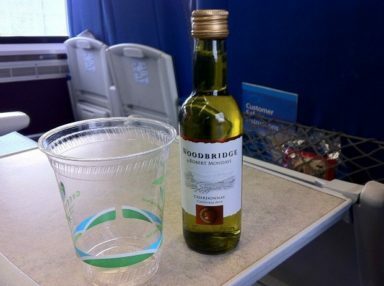 I was told only one beverage a bottle of water no juice no muffins, and when I reached for a tiny soda can too since I don’t drink alcohol -the man slapped my hand saying one per person! That’s mean only on bottle water or one orange juice for 5 hour trip! They are so cheap too filthy seats. No pastries or anything as pictured above! Disgrace especially for the price. I even saw the train guy pick up a napkin off the floor and re use it. We are on our way up to SF from Carlsbad. Amtrak is way less stressful than driving or flying. My son & his friend get to experience train travel & bond in a more relaxed environment. EnJoy!